A view of the 1st green from the 9th tee across the pond. 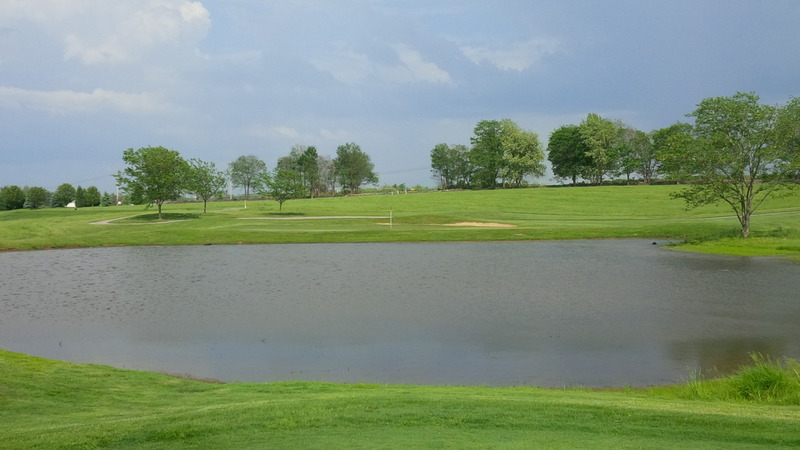 Mark and I snuck out for a quick 18 holes Tuesday afternoon at the Golf Club of the Bluegrass (“GCB”) in Jessamine County. So, I thought I should update my prior post on the former Widow’s Watch Golf Club to detail what I found in 2014. Golf Club of the Bluegrass remains a joy to play, even with a couple dozen McMansions scattered through the northern and western most parts of the golf course. 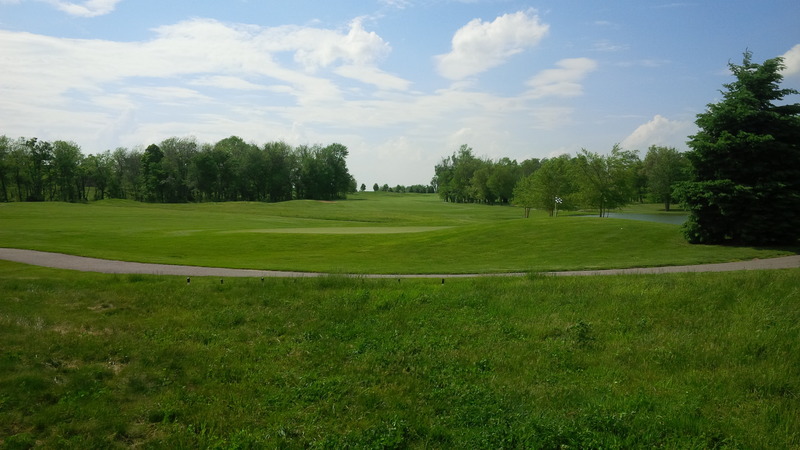 Housing development aside, GCB is a wonderfully natural feeling golf course, one which felt like the fields, forests, and mounding were placed there specifically to support a fantastically natural looking golf course. Though short in distance, the completely exposed surroundings ensure wind plays an important role on the forced-carry Par 3 2nd hole. More than just the aesthetic changes since the early 2000’s, the actual golf course is pretty different. 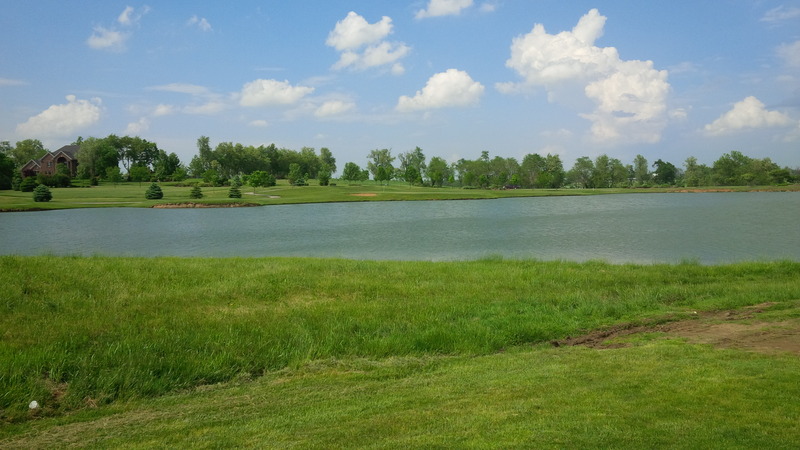 The front pond, from which the course draws most of its water, has been more than doubled in size, a certain necessity for GCB’s tee to green bent grass in Central Kentucky’s sweltering summers. 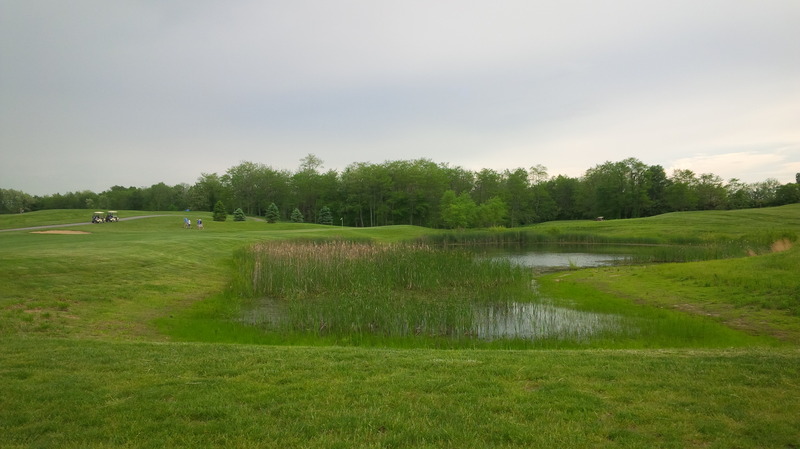 The current second hole, a short par three over the expanded pond area, adds a legitimate forced carry to a course formerly devoid of such challenges. Without any trees or elevation changes to protect the tee shot, the wind complicates the club selection on the 2nd tee. I used to hate this new 2nd hole, because I loved the old 2nd hole from which this one was carved. But I guess I’m getting soft in my middle age, because this little par 3 is starting to grow on me. From behind the 8th green, one can view the length of the now 3rd fairway in the distance. The current third whole was a slightly less angled, super-long par 5 which required a forced carry across the lake from the tee if you wanted to attack the green in two. 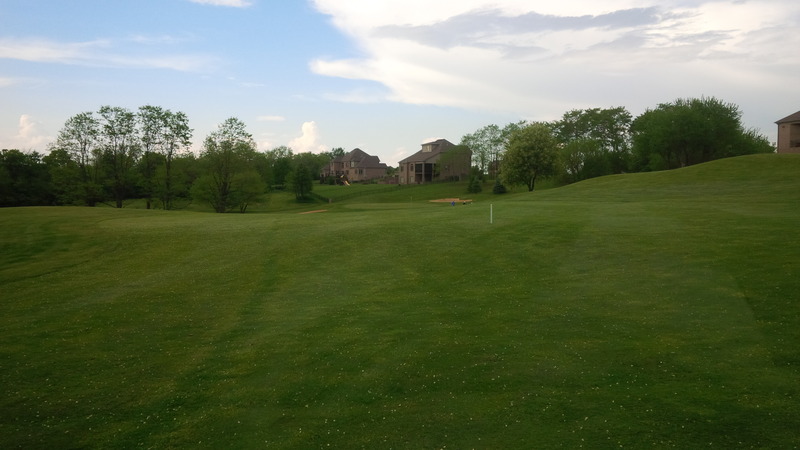 It was a great golf hole that unfortunately has been turned into a short, horseshoed, easy par 5. If you can’t reach the green in two now, you are either playing the wrong tees or have made a huge mistake in your execution. The tee boxes were in really good shape for the most part. 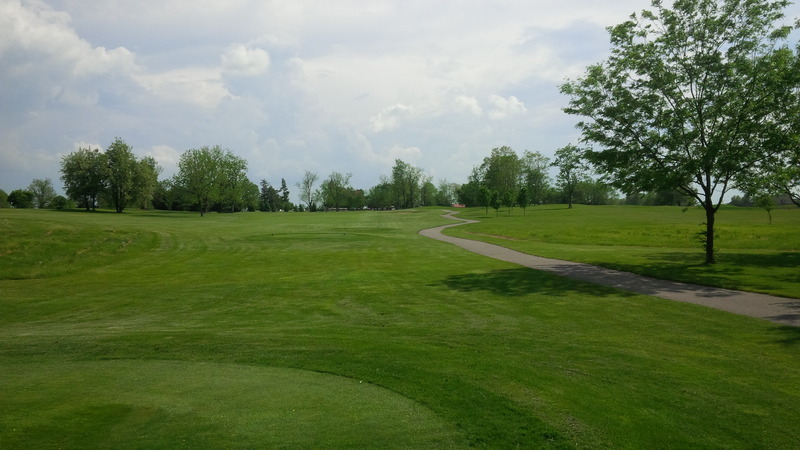 Our wet spring here in the Bluegrass region has ensured that GCB’s bent grass covered tees, fairways, and greens were lush,, long, and a beautiful dark green during our round. 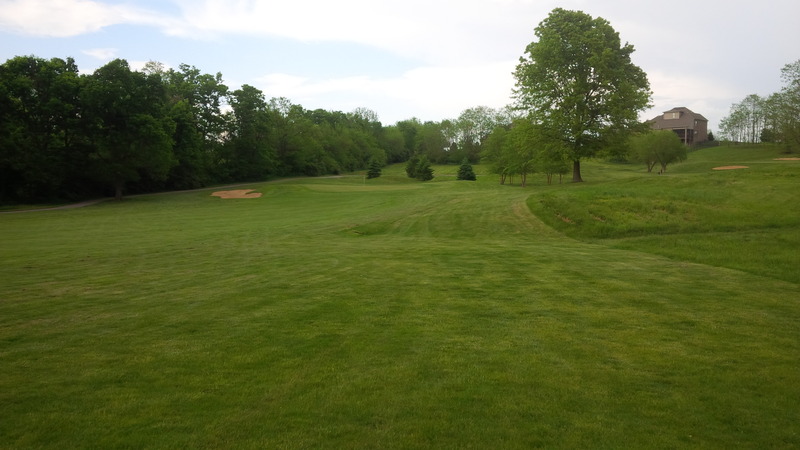 This is the color green I believe Golf Club of the Bluegrass was designed to played, hopefully it lasts past June 1. It has been so wet of late that all the grass was a little long for my liking, inhibiting any roll in the fairways or rough. However, I remember how bad the course can look during overly dry periods, so I’ll accept the trade of the course playing a little slower than I remember. Speaking of memories, this visit to the course highlighted how exaggerated my memories had been with respect to the size of the course and the slope of the greens. One of my main attractions to the course was that only one green was protected from the fairway, meaning GCB set up perfectly for my ground-and-pound game of years past. Upon this visit found the course much gentler and less difficult than I remembered it. The greens are generally still unprotected, save for number 17, but the slope and elevation changes were much less pronounced than I remembered. Hole number 13 is the second of a stretch of four holes that still defines Golf Club of the Bluegrass for me. Nonetheless, some of the natural charm of the course remains. The old trouble spots on the course are the same. The wind still affects play much the same way it used to, and the greens still break just the way I remember them. There are a handful of really good to great, picturesque holes on the back nine that are the real highlight of the course. Secluded on the back of the property, far removed from the roads and most of the housing, holes 12 through 15 are the signature holes of the Golf Club of the Bluegrass, to me. They are the holes that have changed the least, that tie the course’s past to its present. A miss to the right of the 14th fairway left me a second forced carry of the round, though I’m not sure the architect intended this one. They also happen to be pretty darn good golf holes. They aren’t exceptionally long, but there are real penalties for missing the fairways and greens. It’s a stretch that has length and target golf qualities, tied together by a calm and peace owing to this stretch of holes being sequestered on the western edge of the property. Despite the lush grass slowing down roll outs, the course plays shorter than I remembered (another benefit of skewed memories, I suppose). The routing changes to the course make walking it a little less appealing than the former layout, though I’m not sure GCB was designed to be much of a walking course in the first place. GCB has short and long holes, doglegs left and right, long and short par 3’s and 5’s. At its current rates and conditioning, it’s one of the better bargains in the Lexington area. Anyway, visiting the Golf Club of the Bluegrass this spring was like visiting an old friend I hadn’t seen in a few years. It didn’t look exactly like I remembered it, but it was close enough to feel familiar and comfortable. The course is in great shape. It’s matured nicely from the early years. Some of the areas that used to be unmown have been planted with small groves of trees, and they are getting big enough to really compliment the course nicely. Sounds like an awesome course! The overview was great.